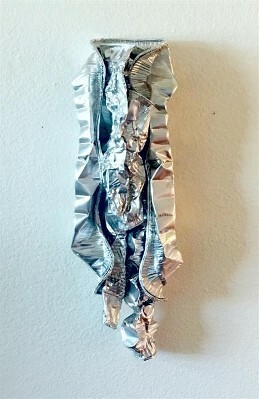 Artist Talk: Saturday, April 13, 12-2 pm, Refreshments. 662 East Frontage Rd. (I-25), Algodones, NM 87001. Only 20 minutes north of the Big I. Open Daily 10 - 5 pm, 7 days a week. 3 TRIANGULAR TRIANGLES (GRAY) DARK RUST ALSO AVAILABLE. 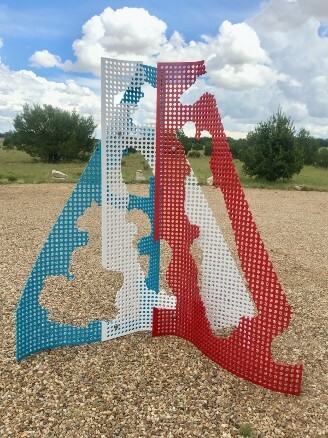 powder coated perforated aluminum, 49" tall. 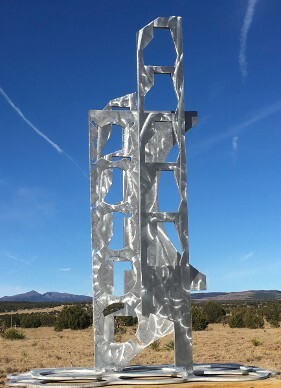 aluminum, 36" tall. 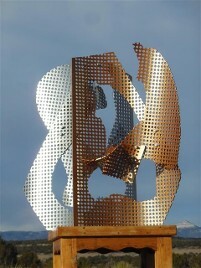 Oxidized Steel Sculpture Featured Below. BulbTop, natural aluminum, 55" tall. 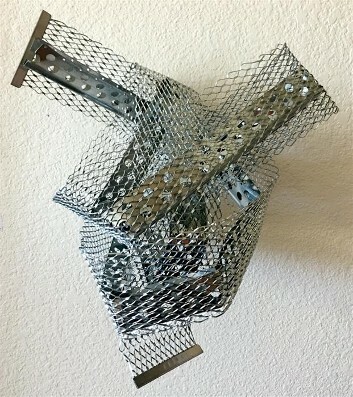 PipeDuct/Cap (bottom and top), galvanized steel, 37" tall. 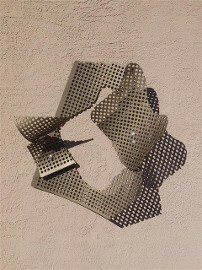 This series is a continuation of the Perforated Triangles (see below) using the recycled 1/4" thick perforated aluminum. 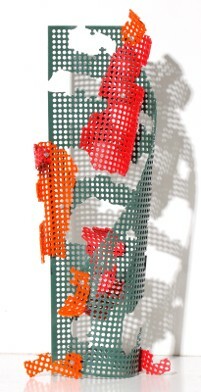 It is an exploration of the nature of verticality and the synthesis of organic and linear shapes. coated aluminum, 10' tall. 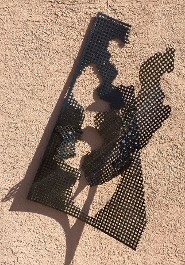 perforated extruded vinyl, 72" tall. 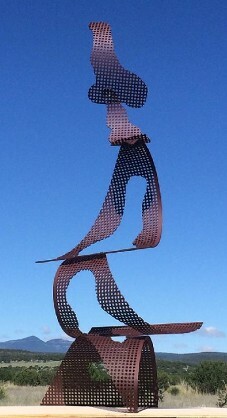 powder coated, 9' tall. the true meaning of vertical began. Louise Bourgeois's Totems provided an exploration of abstracted perceptual ambiguity. Barnett Newman's zip paintings and sculptures took it to its' minimalist essence. Harry Bertoia made vertical sound sculpture. Claes Oldenburg and Coosje van Bruggen celebrated Chicago's baseball and high-rise architecture with BatColumn. Dan Flavin illuminated the vertical with flourescent light bulbs. Finally, the purest expression of vertical appears in the uber-austere edge of a Richard Serra steel monolith in the torrid Arabian desert. And so the search continues with Hook Shafts. 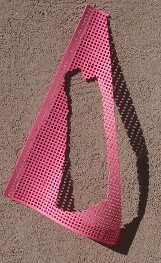 three smaller triangular cylinders have no orgainc cut-outs (two pictured below). 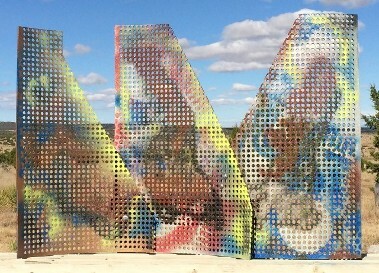 The Perforated Triangles are an interactive component art system consisting of a series of thirteen colorful triangles made from recyled 1/4" perforated aluminum which retain a portion of the shapes and lines of the original fabrication of metal stair balluster panels. Each is unique and idividually made, not an multiple edition. 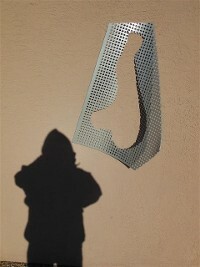 Organic shapes of painted-over graffiti forms are cut out of each triangle and bolted to it. 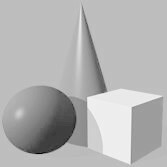 The triangles are softly rolled to accentuate the planar attributes. The triangles can be displayed on the wall or bolted together for floor display. They can be bolted with other components from the later sub series. The colors are as whimiscal as the forms, and are meant to comment on many societal idiosyncracies. Each triangle is approximately 49" high. 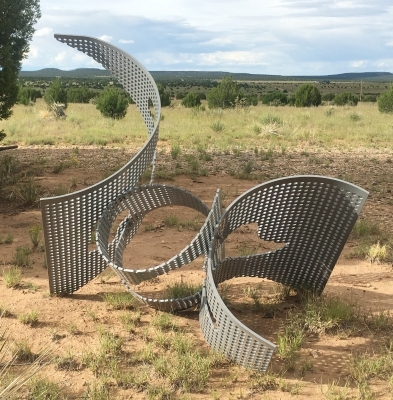 works of four great masters of Modern Art - Donald Judd and John Chamberlain, with a dash of Ellsworth Kelly and Frank Stella. 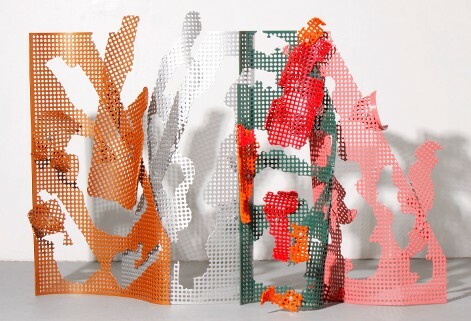 from the original fabrication, encourage contemplation of their own perceptual ambiguity. 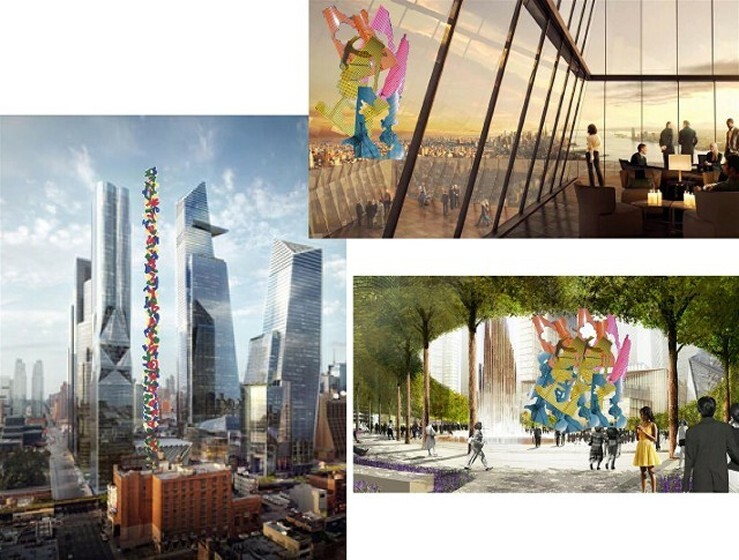 create the world's largest sculpture of Perforated Triangles for the Hudson Yards development in NYC. The colors comment on several contemporary societal phenomena - NFL Pink, OSHA Orange, French's Mustard Yellow, Sparkle Silver, 7 ELEVEN, Glitter Black, Rugy Red, Frigidaire Wet White, Purple Martin. 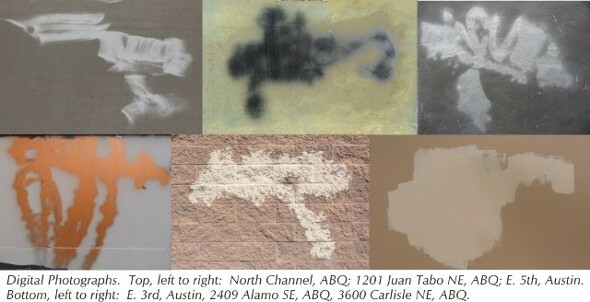 Jeff Laird has been photographing the irregular forms and bleeding colors of painted-over graffiti for over a quarter century throughout the US, including Chicago, Phoenix, Austin, Albuquerque, Santa Fe and points in between. He has created what is reported to be the world's largest collection of images of painted-over graffiti while unearthing the subliminal forces at work. 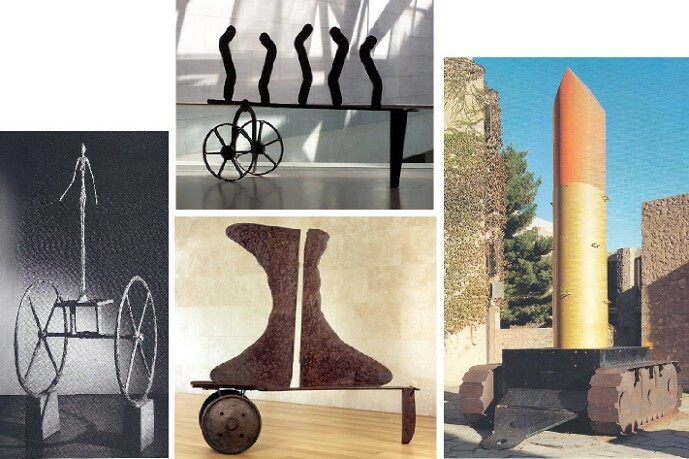 In the process, he has discovered the true meaning of irregular forms in the history of art, from the creation of ancient sculpture to contemporary abstract art. These subconsciously created irregular forms occupy the same cognitive edge of abstraction as much of the Impressionist's work, best exemplified by Monet's hazy trees in his River Seine series. Laird's images possess a direct lineage to the Bauhaus aesthetic and the Institute of Design, Chicago tradition of photographic perceptual ambiguity. They are reminiscent of the fantastical irregular forms of Jean Dubuffet, the tight cropping and bold iconic forms of Ellsworth Kelly, and the fields of bleeding colors of Mark Rothko and Helen Frankenthaler. 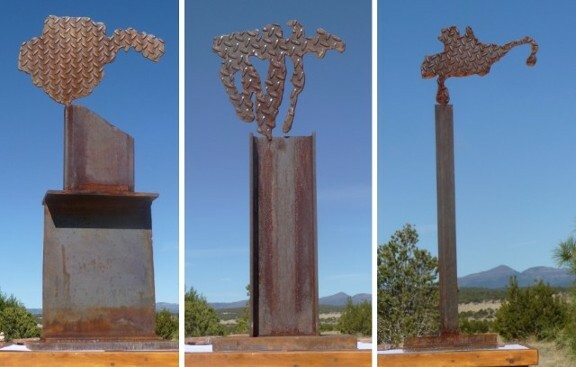 He has created steel sculptures of the irregular forms as trophies that pay tribute to the conscientious citizens who, every day, paint over graffiti for the good of mankind. 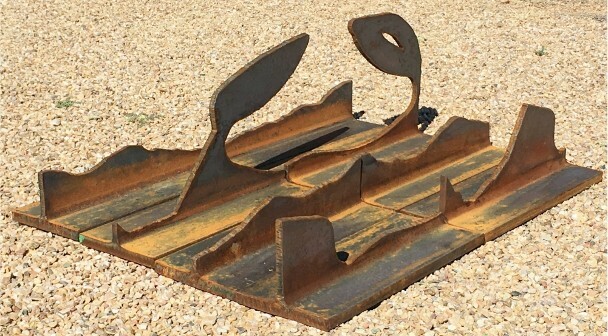 The sculptures express the strength of pure form, flatness and edge, recalling the reductive work of both Giacometti and Donald Judd. 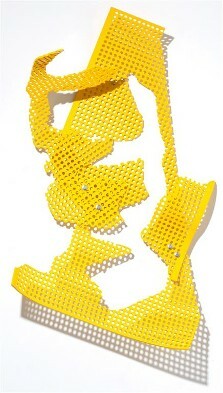 The Outline sculptures are the cut outs from the irregular forms, vertically halved, then slid to the center. 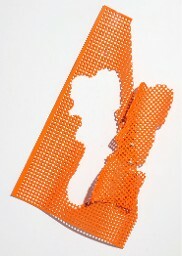 The Derivative sculptures, frequently anthropomorphic, consist of the reassembling of the scrap produced by the cut-outs. His minimalist paintings record the physical attributes of painting over graffiti and the minimalization of fields of over-painting. The paintings express layers of surface, as well as the pure flatness of the picture plane. Like the painted-over graffiti, these paintings are produced with common household colors, which record the societal whims of the times.